With a name like Crocolandia, you can expect a place like this to have lots of crocodiles. And this mini-zoo in Brgy. Biasong, Talisay City, Cebu does in fact have plenty of them. Its most famous croc is a saltwater crocodile named Lapu-Lapu (I have no idea why). 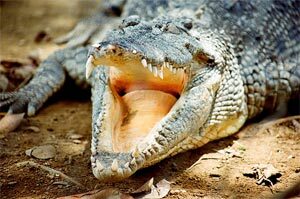 But Crocolandia also houses other animals—reptiles mostly, but there are also birds and mammals there, like warty pigs, deer, ostriches, and hornbills. In addition, Crocolandia helps in breeding the critically endangered Philippine crocodile. Crocolandia is managed by the Crocolandia Foundation, Inc., a nature conservancy organization. It opened back in January 2000 and was the result of a group of people deciding to share their menagerie. (This is very much the same story as the previously-featured Avilon Zoo.) Unfortunately, Crocolandia has no website so if you want to learn more, you can just apply your research skills on the Web or you could call Crocolandia itself at (6332) 2731842.
lapit lang pala sa bahay namin but haven’t been to the place. estan, baka kasi dahil malapit lang naman, maraming pagkakataon na puntahan siya. So libot muna sa ibang lugar sa Pilipinas. Hi. Can you give me link to a map going to Crocolandia? Will be going to Cebu this March but my dad, who’s a resident there is not familiar with the place.